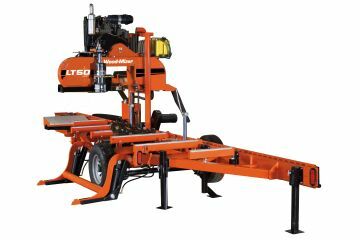 Entry-level sawmill with push feed, 7.5kW petrol engine, 610mm log diameter, 3.3m log length and production up to .37m3/hr. 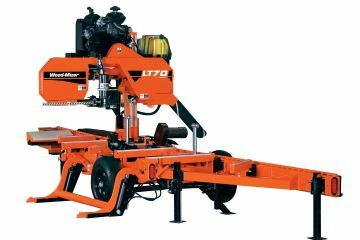 Economical sawmill with push feed, 10.4kW petrol engine, 710mm log diameter, 3.3m log length and production up to .57m3/hr. 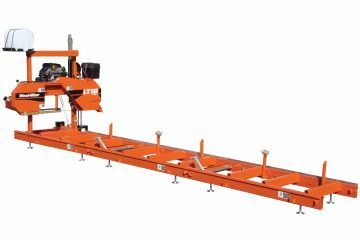 Compact sawmill with crank feed, petrol/diesel/electric power, 710mm log diameter, 5.4m log length and production up to .75m3/hr. Wide capacity sawmill with crank feed, petrol/diesel/electric power, 910mm log diameter, 5.4m log length and production up to .88m3/hr. 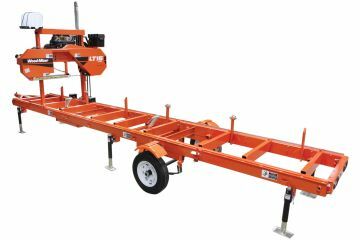 Lightweight, mobile sawmill with crank feed, petrol/diesel power, 710mm log diameter, 5.4m log length and production up to .75m3/hr. 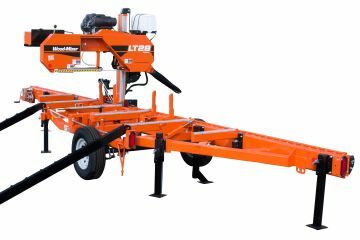 Mobile sawmill with crank feed, petrol/diesel power, 810mm log diameter, 6.4m log length and production up to .82m3/hr. 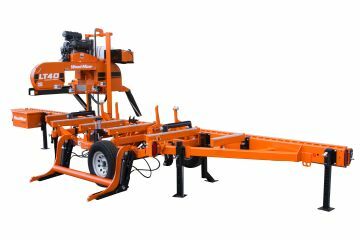 Mobile sawmill with SimpleSet electronic head controls, petrol/diesel power, 810mm log diameter, 6.4m log length and production up to .88m3/hr. 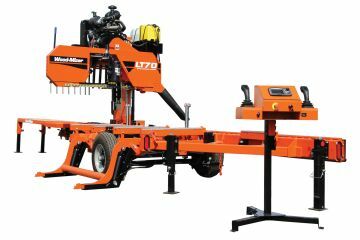 Entry-level hydraulic mobile sawmill with complete hydraulic log handling, SimpleSet electronic head controls, petrol/diesel power, 810mm log diameter, 6.4m log length, and production up to 1.18m3/hr. 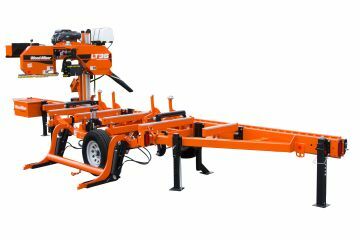 Professional mobile sawmill with complete hydraulic log handling, SimpleSet electronic head controls, petrol/diesel power, 910mm log diameter, 6.4m log length, and production up to 1.3m3/hr. 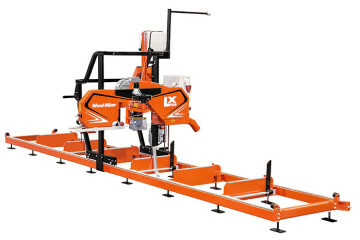 High-performance mobile sawmill with advanced hydraulic log handling, board return, Accuset® 2 electronic head controls, petrol/diesel/electric power, 910mm log diameter, 6.4m log length, and production up to 1.6m3/hr. 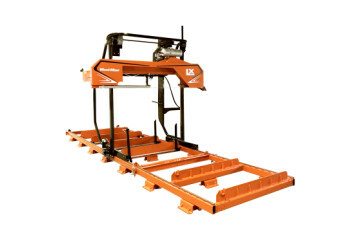 Heavy-duty mobile sawmill with advanced hydraulic log handling, board return, chain turner, vertical supports, precise outriggers, Accuset® 2 electronic head controls, petrol/diesel/electric power, 910mm log diameter, 6.4m log length, and production up to 1.65m3/hr. 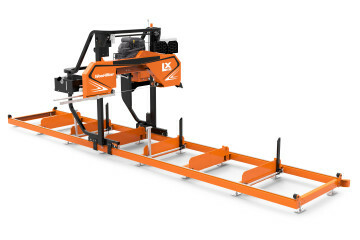 Fully-loaded mobile sawmill with deluxe hydraulic log handling, advanced board return, debarker, Accuset® 2 electronic head controls, diesel/electric power, 910mm log diameter, 6m log length, and production up to 2.2m3/hr. 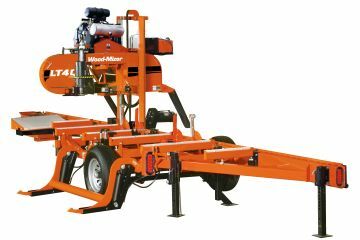 Fastest mobile sawmill with deluxe engine-powered hydraulic log handling and head controls, pedestal control station, advanced board return, debarker, diesel power, 910mm log diameter, 6m log length, and production up to 2.47m3/hr. 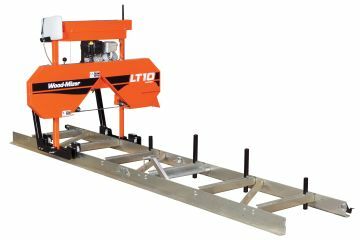 The NEW LX100 Twin Rail Sawmill is built for heavy and continuous sawmilling use and features many innovations in strength, efficiency, and operator visibility. Robust twin rail sawmill with powered saw head controls, gas/diesel power, 910mm log diameter, 5.6m log length, and optional SimpleSet Setworks & Debarker. 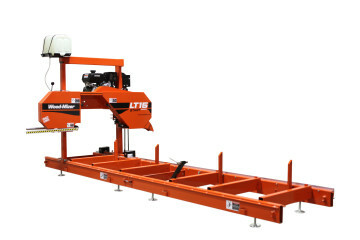 Twin-rail sawmill with advanced hydraulic log handling and board return, chain turner, vertical supports, precise outriggers, Accuset® 2 electronic head controls, petrol/diesel power, 910mm log diameter, 6.4m log length, and production up to 1.65m3/hr.